The Vancouver Condo Buzz » The Rolston Is Now Here! 23 Storeys of Landmark Architectural Design is Coming to the Downtown Vancouver Real Estate Market! The Rolston Is Now Here! 23 Storeys of Landmark Architectural Design is Coming to the Downtown Vancouver Real Estate Market! GREAT PROMO ON NOW > Next 25 Homebuyers get 10% OFF! REGISTER NOW! Tagged as the “Rebirth of Midtown” Vancouver real estate development at The Rolston Condos nears its grand opening of presales. In this truly original and historic community, comes the Midtown Vancouver Rolston condo tower, a significant landmark high-rise that will change the skyline forever. Rising twenty three stories in the Midtown Vancouver real estate district, The Rolston Condos is unlike any other tower that has been built or designed. Midtown Vancouver, the region that stretches from False Creek all the way to downtown Vancouver’s business district and from Homer to Burrard street, will change very soon into one of the most sought after communities for new homebuyers seeking the best yet affordable property for sale. From this unique neighbourhood, residents at The Roslton Vancouver condos for sale can enjoy everything from fine and casual dining to boutique shops and big box retailers at any time of day. This walkable neighbourhood is just the beginning of what’s going to happen in the next decade. As its name suggests, the downtown Vancouver Midtown real estate district is the central nexus of this region and the downtown peninsula of this incredible city is pioneering how other cities in North America are being designed and built. Here at The Rolston Vancouver condo tower, you will find yourself in the midst of an incredible downtown neighbourhood that is sustainable, livable, healthy and environmentally sensitive. On top of all of this are the cultural amenities in Midtown Vancouver community that includes such places as the Contemporary Art Gallery, Pacific Cinematheque and The Dance Centre. Also close by is Yaletown, the trendy district, and Granville Island. Midtown Vancouver real estate district offers The Rolston condo homebuyers and residents a place that has authentic history and a true sense of being centrally located. Right now, the pre-construction Vancouver Rolston Condos are in the final stages of planning and design, and will become available through presales shortly. The Rolston Vancouver Midtown condos are coming soon, so watch out for all the updates here on the Buzz. 2. 5% Interest on your Deposit till close! The Rolston – Opening May 1st! The opening date for The Rolston Downtown Condo Pre-Sales Event is right around the corner! As a Downtown Vancouver Rolston VIP Registrant, we would like to invite you to our VIP Opening on Saturday, May 1st at 10 am. Each pre-construction Downtown Vancouver condo suite at The Rolston Midtown Condominiums has been designed twice: The Yale and Cecil Editions. Two different interior Rolston floor plans for the same suite reflect two different living styles. In addition, we offer three color palettes for you to choose from. $10,000 initial deposit increased to a total of 10% within 8 days. An additional 10% upon receipt of the Vancouver Roslton Condo building permit (not before 120 days) for a total of 20% of the purchase price. Deposit options are available to pre-sale Vancouver Rolston homebuyers, so please ask sales team for details. 30 month rate hold by Bank of Montreal. Again, please ask sales team for more details about special Vancouver mortgage financing packages available for the pre-sale Rolston Condos. The midtown Vancouver Rolston Condo development is estimated to be complete and ready for occupancy Winter 2012. To assist in deciding which new pre-sale Vancouver Roltson condo home is right for you, our sales team will help with every step along the way: from touring the display homes, selecting your layout, to choosing the home best for you! Should you have any questions regarding this RIZE Alliance Rolston Vancouver boutique condo development, please do not hesitate to contact us at 604-688-8927 or info@TheRolston.com. We look forward to meeting you in person! Sincerely, The Vancouver Rolston Sales Team includes Pam, Sean, and Adriana. All prices at The Rolston Vancouver boutique condos for sale exclude GST/HST and are subject to change without notice. In a continuing effort to meet the challenge of product improvements, we reserve the right to modify or change plans and specifications of the Rolston condos without notice. All sizes of Rolston floor plans are approximate. Refer to the disclosure statement for specific details. E. & O.E. Much like Robson Street 20 years ago, the downtown Vancouver Granville Street real estate corridor is going through incredible changes these days. One of the brightest spots is the new Downtown Vancouver Rolston Condo tower, that will define a new landmark condominium tower based on ultra high-end style, architecture and design prowess by Rize. Definitely on the cutting edge of design, the new Vancouver condos at The Rolston situated along the Granville Street real estate corridor at Drake Street features playful architecture with splashes of green, bright red and steel greys with impressively large private balconies and a great curb appeal. The Granville Street Rolston Vancouver condos for sale is fun loving and is brought to the real estate market by Rize Alliance Properties. The Rolston Presentation centre will soon launch in mid-April for presales and will give homebuyers a great choice between 2 designer selected colour and finishing packages that are innovative, cool and truly modern. There are also two completely different versions of the same floor plan, one which gives you more living space, while the other is centred on more sleeping space. The Yale is more traditional while the Cecil is more open concept and modern. Either way, the downtown Vancouver Rolston Condos for sale will present functional floor plans that give you lots of space to grow. As the Olympics being a catalyst for the promotion of this great and central Granville Street location, the Rolston Vancouver condo tower will also be the catalyst for the rebirth of Midtown Vancouver, a location that is central and affordable for homebuyers still. The revitalization of the area has already begun. The Rolston Vancouver condos will offer only 186 conodminium homes that will have LEED Gold certification once complete. Smart, sustainable design is what the Rolston Vancouver is all about, and with prices starting from the $300’s, these affordable Vancouver condos will surely find new homeowners quickly. The Rolston Presentation Centre will be located at 999 Seymour at Nelson Street. 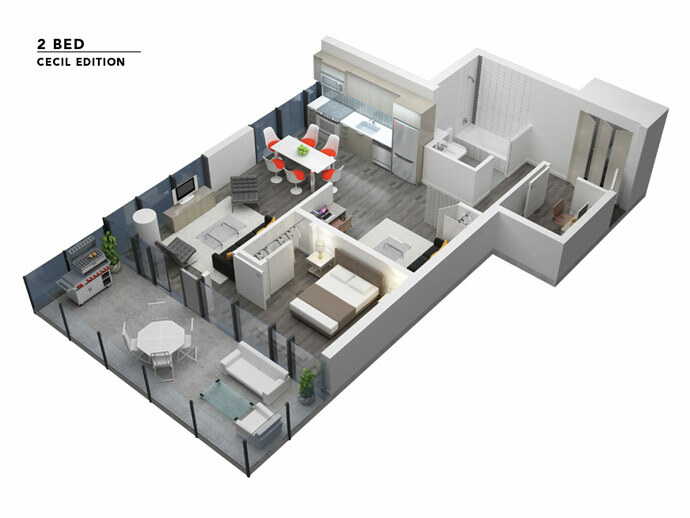 The Rolston website now features new 3D renderings and 2D floor plans! Simply click the Interior tab to view a sampling of the downtown Vancouver Rolston layouts that will soon be offered at The Rolston Midtown condominium tower. Choices: Not only does The Rolston Vancouver downtown condos have three different color schemes to choose from, but two completely different versions of the same Rolston floorplan will also be available to homebuyers – The Yale Floorplan, for people who want a more traditional bedroom, dining room and living room configuration, and The Cecil Floorplan, for people with a lifestyle that demands open-concept living. With such a variety of choice here at the Midtown Rolston Vancouver Downtown condos for sale, you can truly create a unique home that reflects your preferences and tastes. Decisions… Decisions: So which will you choose….The Yale? The Cecil? Which color scheme? Tile? Countertop? Our Midtown Rolston Condo Presentation Centre will be opening in mid to late April, giving you the chance to see firsthand what makes The Rolston Vancouver downtown condos such a unique opportunity. With one bedroom presale Vancouver condo homes starting at only $300,000 and two bedrooms from $430,900, The Rolston Midtown real estate development offers creative design at an affordable price! Opening Soon: We will be contacting you soon with the details of our Rolston Presentation Centre opening dates. In the meantime, feel free to contact us with any questions, and remember, during your visit to www.therolston.com you can sign up to follow us on Twitter or join our downtown Vancouver Rolston Condo Facebook Fan Page. Sincerely, The Rolston Sales Team, Otezs Project Sales, Macdonald Realty – The Rolston Sales Office: 604-688-8927 or Email: info@therolston.com. The Rolston Vancouver Condo Website is now Live! We are pleased to inform you that The Rolston website is now live! 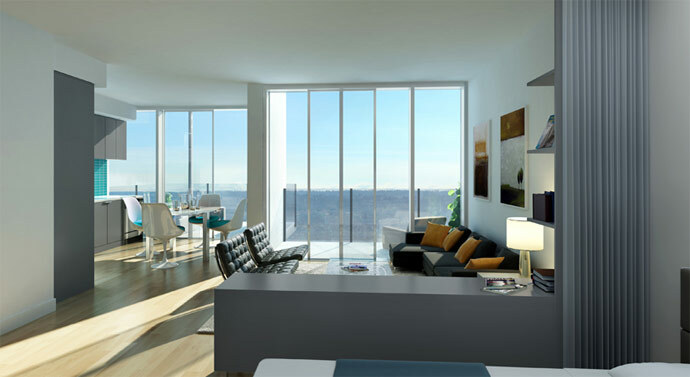 Featuring an overview of the Midtown Vancouver real estate neighbourhood, artistic rendering of the building and interiors, you will see why The Rolston Vancouver condos for sale will be a landmark in Vancouver real estate’s downtown district. Midtown Vancouver District – This is urban living in its truest sense. From the seawall to shopping, from restaurants to galleries, everything is at your fingertips, in the center of one the greatest cities on earth. Design – The Rolston Vancouver downtown condos for sale achieves an individuality of design that few can match. This iconic Vancouver condo landmark architecture and well crafted interiors provide owners with a sense of pride. Interiors – With an unprecedented choice of two distinct layouts for each suite, offered in three different color palettes, your style can be reflected in your home here at the new downtown Vancouver Rolston condos for sale. This collection of one and two bedroom Rolston Vancouver homes will range in size from 460 to 890 square feet. Our Rolston website showcases a unique sampling of 3D floorplans, so finding your home has never been easier. Outdoor Space – The Rolston Vancouver landmark condo tower offers an abundance of outdoor space in the heart of urban living, featuring a 16th floor Terrace and Rooftop Garden. Enjoy the amazing views while dining with friends or soaking up the sun. During your visit to TheRolston.com sign up to follow us on Twitter or join ourFacebook Fan Page for updates to the previews and grand opening launch of the downtown Vancouver Rolston condo landmark tower. Sincerely, Pam, Sean and Adriana, The Rolston Sales Team at Otezs Project Sales, Macdonald Realty – Sales Office: 604-688-8927 or Email: info@therolston.com. Greenery, green spaces and landscaping. Wow. If you are in need of some green space in and around your new Vancouver Midtown condo, The Roslton condominium tower certainly delivers in every aspect. The Rolston Vancouver is situated within a couple of minutes of Vancouver’s endless seawall, private green space cannot be undervalued in this sustainable offering of urban condominium living. All homes here at The Rolston Vancouver condos has outdoor living space in the form of decks, balconies and terraces that are clearly larger than any other project out there. The Rolston floorplans are outstanding, open concept, bright and cheery, making your life even more beautiful. To complement each and every private outdoor space, The Rolston Vancouver condos in Midtown Downtown also present two outdoor amenity spaces. The first one is on the sixteenth floor, which is an outdoor rooftop terrace with spectacular views of the Midtown Downtown location. Here, residents will find outdoor furniture, barbeques and tonnes of space to entertain and socialize. Secondly, the downtown Vancouver Rolston condos for sale will also feature a view garden that has community garden spaces to plant your favourite spices, vegetables and fruits in addition to a yoga studio too. Striking. Elegant. Unique. Always a challenge in Vancouver real estate market is to design and create something extraordinary and different from the norm. The Rolston condo architecture is just so incredibly beautiful and different that homebuyers are looking at it as a landmark iconic building already. The Rolston Vancouver achieves an individuality of design that few can match. This iconic stature provides home owners with a sense of pride of being part of a building that is very unique. The Rolston Midtown condominiums also have amazing interior finishing and design, which is ultimately important in every homebuyers’ decision on a new home. Here, you will find two different colour schemes that have been professionally designed and selected. With open concept spacious floorplans, the downtown Vancouver condos for sale at The Rolston provide many offerings and opportunities for you to own in the up and coming Midtown district. The 26 storeys of pure elegance will be coming soon to the Midtown Vancouver real estate market, so check back often for more information about The Rolston condos including pricing, floor plans and features lists. You can also follow them on Twitter and Facebook. The Vancouver Rolston Condos are a featured project by Rize Developments. Here is more information from the Vancouver Rolston Condo website. Being part of the downtown Vancouver real estate core is one thing, but being in the crossroads between Yaletown, the Business District and Entertainment Districts is another. Becoming one of the most dynamic communities within the downtown Vancouver real estate district, the Midtown community is growing and The Rolston condo tower will become the centre point for liveability. From sustainable and pedestrian friendly walkways to tonnes of local shopping and dining hot spots, the Midtown Rolston Vancouver condos will be centrally located for residents to experience everything that downtown has to offer. Next to the Dance Centre, Pacific Cinematheque and even within walking distance out to Granville Island, the Midtown Vancouver Rolston condominiums are part of this up-and-coming neighbourhood that gives you choices. The architectural design of the new Rolston Vancouver condos is breathtaking and will create an instant icon for a downtown core that struggles with its identity and lack of forward thinking design. The interiors are spacious and functional. The Vancouver Rolston Yale floorplans provide larger bedrooms. The Cecil floorplans at The Rolston provide larger entertainment spaces. It’s really your decision which one you prefer, but both will become available here. Part of healthier and sustainable living is outdoor spaces, and each of the suites at The Rolston Midtown Vancouver condo tower have private balconies. In addition, there are also two outdoor community spaces for you to enjoy: The Terrace at The Rolston and The Gardens at The Rolston. The development group includes RIZE Development and Construction, IBI Group Developers, Cause+Affect Designers, Eckford + Associates Landscape Architects and Macdonald Realty/Otezs Project Sales. 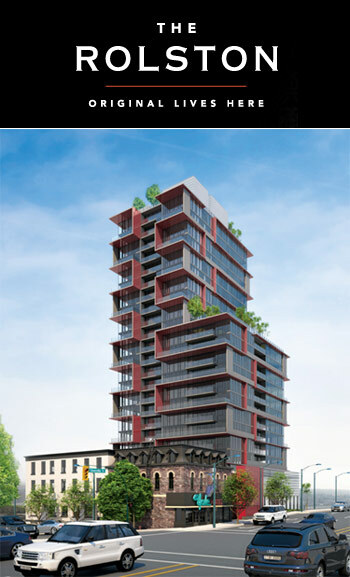 The Rolston Sales Centre is at 999 Seymour Street, Vancouver and is opening soon.